The most elegant pools require the most elegant finishes, and when it comes to plaster, you have TOO MANY options. But one of our jobs is to simplify the complex. In short, there are four main types of plaster that Absolute Pools uses to waterproof your pool, each of which has many variations. They are marcite, Diamond Brite, Hydrazzo and PebbleTec. Hydrazzo is by far our most common and popular plaster, and we typically use Hatteras Gray and French Gray. Marcite is white Portland cement and marble dust with your choice of colorant, if desired. This is the oldest and least expensive option, but, as a result, also the least durable. Marcite will typically last 5 to 10 years, and we generally recommend that you don’t use this option unless your budget doesn’t allow the other premium finishes. Marcite starts out bright white, but with colorant, it can be any shade of gray and even other colors. But with so many other, more modern options available, it just doesn’t have the durability that we insist on at Absolute Pools. Diamond Brite is made with natural quartz – one of nature’s hardest and purest minerals. Diamond Brite’s insoluble quartz aggregate is unaffected by the harshest pool chemicals and resists permanent staining, as well. Diamond Brite is an exposed aggregate, which means it isn’t smooth. With a life expectancy of 10 to 15 years, and with a stunning appearance, it is an excellent choice for some pools. This option provides the best bang for the buck – it is truly beautiful and durable, but it just doesn’t feel as luxurious as our all-time favorite plaster, Hydrazzo (see below). For more information on Diamond Brite, visit sgm.cc. The most beautiful pools in the world are surfaced with the hand-polished magic of Aquavations Hydrazzo. It’s the smoothest, richest and most luxurious surface available, formulated from time proven technology and the earth’s finest raw materials. Aquavations Hydrazzo combines naturally beautiful coarse graded crystalline and colored marble, along with white Portland cement and a host of other performance enhancing ingredients to create the ultimate pool coating. The secret to the Aquavations Hydrazzo finish is the final step – polishing the surface to a brilliant luster, and thereby unlocking the marble’s natural beauty and its extraordinary strength. The finished color is breathtaking, achieving a soothing and color-intensifying effect. Aquavations Hydrazzo is the “smooth sensation” in exposed aggregate pool finishes, friendly to fingers, toes and swimsuits. Hydrazzo is expensive, but it’s worth every penny. With an expected life of 15 to 20 years, along with a smooth feel and gorgeous looks, Hydrazzo is the right choice for most luxury pools. For more information, go to aquavations.com. At the upper-end of the pricing range, Pebble Tec is for clients who have an over-the-top pool that requires an over-the-top pool finish. The only way you can make the pool fancier is to tile the entire interior (which we have never done but look forward to the day when one of our clients wants the ultimate in luxury pools). PebbleTec provides a textured finish with large pebbles and stone aggregates. Available in a range of colors, this material provides a great non-slip surface and an earthy look and feel. The company also offers three new varieties – PebbleSheen, which uses smaller pebbles; PebbleFina, which uses exceptionally fine, almost sand-like pebbles and a smoother feel; and BeadCrete, which trades out the pebbles for smooth glass beads that catch and reflect light and offer a crystalline appearance. PebbleTec will last 20 years or more, and is the most durable finish available. It’s smooth and insanely gorgeous, but we feel it’s generally not the best option for most of our clients. Visit pebbletec.com for more information. As you plan your pool, Absolute Pools & Waterscapes can walk you through these and other options to help you select the perfect finish for your pool as part of the design process. 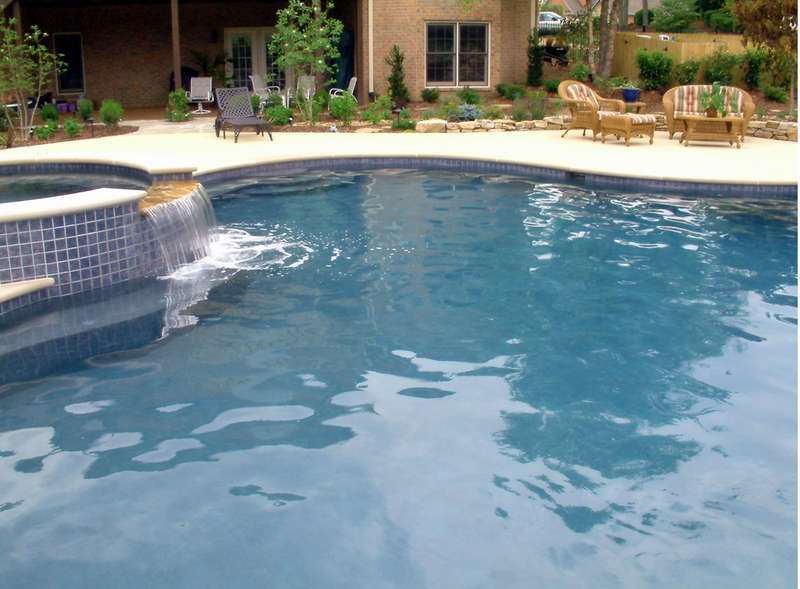 Serving Nashville and the greater vicinity, we design and build the best residential pools at reasonable prices. If you are in the market for a custom pool, call owner Brad Shuman today at 615-354-1840.